You know we are big fans of pancakes around here. We make them with pumpkin and lemon and leftover quinoa and corn; we eat them when we’re out and when we’re at home; we follow recipes from picture books and children’s books but for the most part, aside from the occasional airplane or Eiffel Tower when Tony is wielding the pancake flipper, pancakes here are plain, round, circles. The cookbook I’m offering you today wants to change all that. 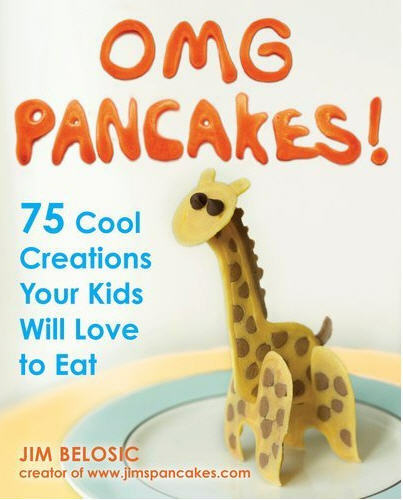 Jim Belosic’s OMG Pancakes! shows you how to use a couple squeeze bottles, some food coloring, and one uncomplicated pancake recipe to add some fun to the pancakes on your plate. Cats and dogs, sure, but also giraffes, frogs, rocket ships, bulldozers, guitars and more. The publisher sent us an advanced copy, so the pictures aren’t in color, but the techniques and the recipes are clear and easy to follow. Leave a comment with your email by the end of the week and I’ll draw one winner. Sounds pretty interesting. Count me in please! Thanks for your comments! Dena is the winner this time, but there’ll be another book giveaway next week so please check back.